In the market for a new flat iron? FlatIronExperts.com has a huge selection, as well as great sales. A flat iron is an investment, and one should do the appropriate research before buying just any old flat iron. Each item has customer reviews so you can do the appropriate research and make sure you are buying the flat iron, curling iron, etc., that is right for you. 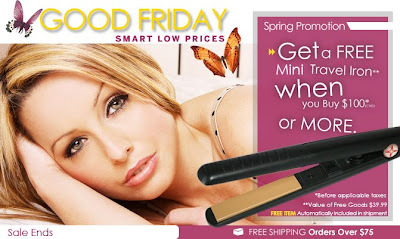 Their current Spring promotion: Spend $100 and get a free travel flat iron for free! Use the code ANGELA5 at checkout to receive an additional 5% off your order!